Itzhak Perlman, internationally celebrated concert violinist, soloist, teacher and conductor, spoke to an attentive standing-room-only audience of music students in the Rothwell Recital Hall on Thursday, Oct. 6. 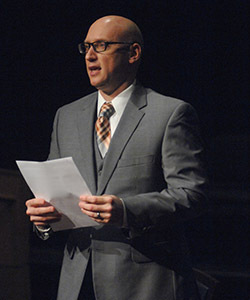 Later that evening, Perlman would speak before a much larger public audience as the 12th in the Judge Joe J. Fisher Distinguished Lecture Series. 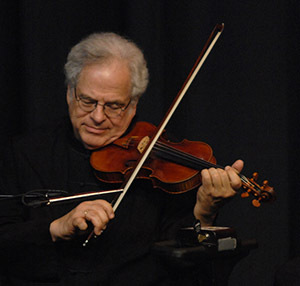 Perlman is known for his ability to evoke emotion and lyricism from his violin, making deep connections with his audiences. Since he first asked his parents for a violin at age three, he has become one of the most well-known and respected instrumentalists in the world. 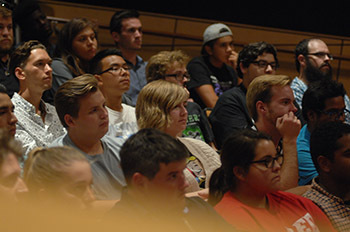 A recipient of the 2008 Grammy Lifetime Achievement Award, four Emmy awards and the Presidential Medal of Freedom among countless others, he answered a broad range of student questions between telling stories, discussing his career in the context of a changing music industry and, most of all, extending advice. His booming voice and quick wit in extending such advice reached even the farthest reaches of the room, while his unpretentious appearance—gray curly hair, glasses, blue tee—eliminated the barrier between himself and the crowd. Although a table was originally set up, Perlman opted instead to sit, unobstructed, in front of the audience next to moderator Brian Shook, interim music chair. As student questions were read by Shook, Perlman listened carefully, then answered enthusiastically, gesturing emphatically. 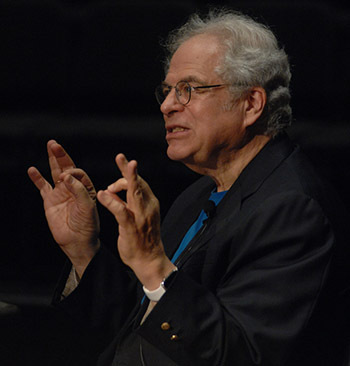 Throughout the session, Perlman stressed the importance of fine-tuning one’s listening skills as they progress with their instrument – and with their life. Perlman admitted, smiling, that he later found a way around that. When introduced by a doctor to the Feldenkrais Method of gentle movement and meditation, he would tell his mother in moments of silent boredom that he was practicing—via the Feldenkrais Method, of course. 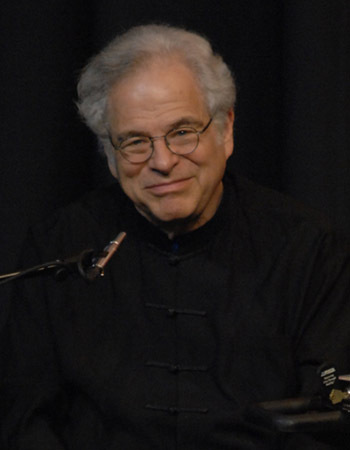 After telling of his move from Tel Aviv, Israel to New York at age 13 to continue his studies and being suddenly thrusted into the international performance circuit following an appearance on the Ed Sullivan Show in 1958, a student asked Perlman if he still gets nervous about performing. He laughed. He told of a fellow musician plagued by nerves with whom he had toured. Before every performance, the musician ceremoniously consumed a Hershey chocolate bar, a Coca-Cola and a cheese sandwich. After teasing that the audience reaction was overly polite for the Bach piece, his fast-moving, emotional rendition of Wieniawski was met with thunderous applause and a standing ovation. A student asked if he could cite one stand-out, influential performance he had either seen or played himself. He thought for a moment. Going forward in the student session, Perlman contrasted different concert halls worldwide and various orchestras he’s worked with. He discussed his hobbies and admitted he hates travel. 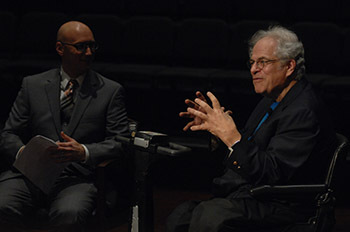 After a student asked if he believes it’s important to learn the context around a piece, Perlman said it helps more to understand the preferences of the musician whose work is being played. According to Perlman, the key to his success and his continued adoration of the violin has been resisting boredom. He said that going forward, he hopes he can approach all pieces—even those he has played countless times—with excitement. This hope is the only thing left on his bucket list (except for the bucket, of course).